Obviously, if poor drainage is an issue we strongly recommend getting that attended to before you prep or install a new lawn. Get some expert advice and ask about options such as using ag pipe, raising the level of the yard, and improving the soil by adding free draining material. In some cases there’s not much that can be done – perhaps you’re in an extremely low lying area or you receive lots of run-off. The best option is Zoysia – it suffers the least damage during floods, doesn’t mind getting its feet wet and their turf rolls are far stronger than Kikuyu or Couch. In testing, the Zoysia turf withstood 2 metres per second flows immediately after installation – far better than Kikuyu, Couch or Buffalo. They can all handle the occasional wet event and even a few days of being underwater but for a yard that is consistently wet, these turf varieties will eventually rot. As an added bonus, the Zoysia is also drought tolerant and fairly low maintenance. This makes it a great option for rental properties, holiday homes and commercial properties. 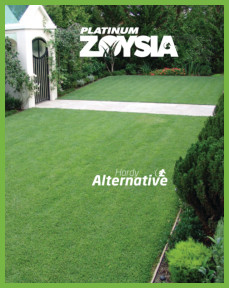 Harden Park Lawns grows and supplies Platinum Zoysia. If you do get your drainage issues sorted, Harden Park Lawns also grows and supplies Sir Walter DNA Certified Buffalo, Tropical Turf (a Buffalo variety) and Tropical Turf Mix (80% Buffalo and 20% Couch) and Queensland Blue Couch. Contact our expert team today for more assistance on the best type of lawn for your place.